Wherever you want to enjoy a good culin or toast with a sparkling cider, there will be Sidra Trabanco. This is our objective when it comes to promoting a distribution network that brings our cider to all the provinces of Spain. Thanks to the work carried out in coordination with our distributors, Sidra Trabanco is a cider already recognised and appreciated in cider houses, restaurants, bars, wine shops, catering companies, hotels, etc. in more and more areas of Spain. To this we can add the distribution in large supermarkets, hypermarkets and supermarket chains throughout Spain. Cider is a rising value. And its consumption is increasing, and not only in Asturias. Hence the importance of our national distribution network. More and more people are fond of a culin or a toast with cider for the good news. 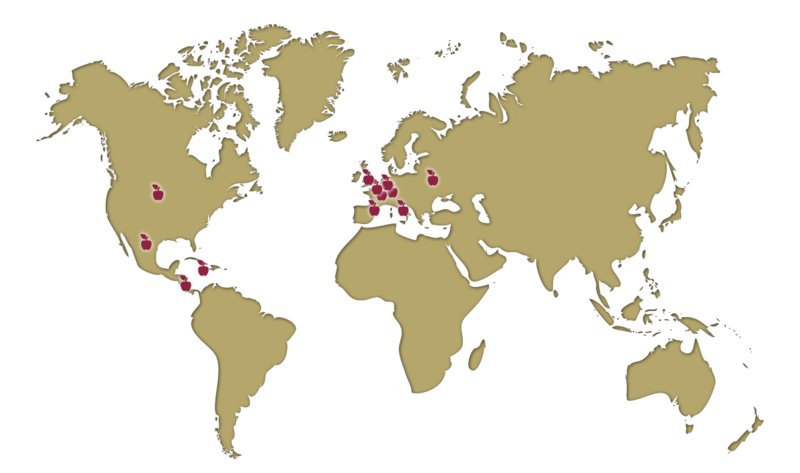 Discover in this map where you can find right now cider from Trabanco. And, if your country does not appear, write to us (link to form) and we will do our best to bring all the tradition and know-how of Trabanco cider wherever you are. Do you live in any of these countries and you want us to take you Cider Trabanco?